OVERLY LONG CONSTRUCTION FORMS Scare & Intimidate your customers! Read below for an explanation. KEEP Your Contractor Forms CURRENT with any new laws! CONTRACTORS, particularly CALIFORNIA contractors... Are you tired of trying to keep up with all the law changes from CSLB and other state licensing boards that have jurisdiction over you? ASK US how we keep your software forms current with any NEW LAWS... without expensive upgrades! 2019 Contractor legal forms,marketing forms, bid forms contracts for general contractors, construction business forms, construction contract forms, construction bid forms, construction form, contractor forms, bid forms, construction form software, contractor insurance forms, roofer forms, roofing forms, roofing contractor forms, painting forms, painter forms, painting contractor forms, electrical contractor forms, plumbing contractor forms, HVAC Contractor Forms, Pool and Spa Contractor Forms, business forms, pre lien, lien release, subcontract forms, Service and Repair Contracts, 20 Day Notice, Door Hangers, Construction Marketing, trade specific forms available in VERSIONS FOR ALL 50 STATES including California Contractor Forms, Nevada Contractor Forms,Louisiana Contractor Forms, Florida Contractor Forms, New York Contractor Forms, Arizona Contractor Forms, Minnesota Contractor Forms, Michigan Contractor Forms, Tennessee Contractor Forms, New Jersey Contractor Forms, Oregon Contractor Forms, Utah Contractor Forms, Wisconsin Contractor Forms, Ohio Contractor Forms, Oklahoma Contractor Forms, Virginia Contractor Forms, Georgia Contractor Forms, Hawaii Contractor Forms, Alabama Contractor Forms, Alaska Contractor Forms, Arkansas Contractor Forms, Colorado Contractor Forms, Connecticut Contractor Forms, Delaware Contractor Forms, Idaho Contractor Forms, Illinois Contractor Forms, Indiana Contractor Forms, Iowa Contractor Forms, Kansas Contractor Forms, Kentucky Contractor Forms, Maine Contractor Forms, Maryland Contractor Forms, Massachusetts Contractor Forms, Mississippi Contractor Forms, Missouri Contractor Forms, Montana Contractor Forms, Nebraska Contractor Forms, New Hampshire Contractor Forms, New Mexico Contractor Forms, North Carolina Contractor Forms, North Dakota Contractor Forms, Rhode Island Contractor Forms, South Dakota Contractor Forms, South Carolina Contractor Forms, Vermont Contractor Forms, West Virginia Contractor Forms, Wyoming Contractor Forms and Washington Contractor Forms. Contractors Forms, Construction Forms, ACT Contractor Form Software, Forms for Each of the 50 States. Ipad & forms for other tablet devices. Contractor Forms Software & Custom Printed Forms specific for your Contracting Trade and State- 2019 VERSIONS AVAILABLE NOW for EVERY STATE! Form samples can be previewed on this website! LOOKING FOR FORMS FOR INSURANCE REPAIR WORK (Hail Damage, storm, fire, flood, wind)? WE HAVE THEM! ROOFING CONTINGENCY FORM, CONTINGENCY FORM FOR REPAIRS, AUTHORIZATION OF INSURED FORM, SUPPLEMENT FORM, INSURANCE BID FORMS, FLOOD MITIGATION AND REPAIR FORMS, RECOVERABLE DEPRECIATION FORM, RELEASES, DIRECT PAY FORMS, ... AND MORE! Contractors, we have the very latest (2019) Contracts and other Forms in versions for EACH of the 50 STATES! Our forms are UPDATED Immediately upon any law changes for each state so you always have the most current forms possible! Celebrating over 20 Years keeping contractors SAFE, LEGAL and PROSPEROUS! Our Stand Alone Form Software Program... ACT Contractors Forms Software. We offer Custom Printed Paper Forms (white & yellow copies NCR). We offer PDF forms that can be emailed to you in a few minutes! Ipad forms and forms for other tablet devices. We offer custom form creation to your specifications. Forms can be created as a PDF form, as a form we print for you, as a high resolution PDF that can be printed by your local commercial printer, or as a form to work with our software program... ACT Contractors Forms Software. Over 20 years of construction form experience goes into everything we sell! We know once you see our forms you'll agree that ACT Contractors Forms Software makes a one or two man operation look like you have 20 guys in the office... and makes a twenty man operation run more efficiently that it ever has before! WE HAVE PROFESSIONALLY WRITTEN AND TYPESET Construction Contractor Forms... not the multi page contract "letters" that others offer! Our forms do not get longer as you type like Microsoft Word based forms. 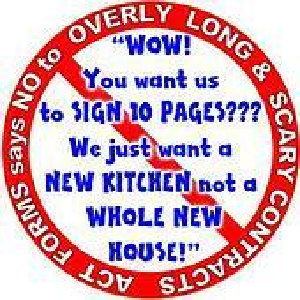 We don't want you to scare your customers with letter type contracts that are pages and pages long. That's why we designed most of our forms on a single page (front and back). Our contracts and other forms do a better job protecting you with a much less threatening look. Our forms are here for you to take a look at. Over the years, we have had customers use our forms for $300 jobs and we have had customers use our forms for $3,000,000 jobs... We're proud of that! Experience has taught us to KNOW what SHOULD be on your forms and what SHOULD NOT be on your forms. All you need to see any of our samples is the FREE ADOBE ACROBAT READER version 7 or later. We know how good our forms are so we don't have to hide them from you. And we do not hide behind our website. Give us a call anytime between 7:30am and 8:00pm M-F Pacific and we will be here to answer any question you have about using our forms and form software. Call us and we will help you decide which of our products will best fit your needs, and we will help you with your order. Fill out and print as many or as few construction forms as needed, conveniently from your computer for pennies a copy. What you see on screen is what you get when you print the form so there are no mistakes or waste. Use plain paper or use carbonless paper. Either way, we'll teach you how! Start printing your forms right out of the box because we will custom burn a CD for you with your information in place on each and every form. Or you can save money and easily do it yourself. Use color on your forms and include your LOGO or pictures. Check the spelling with the built in spell checker. Have all the documents you will ever need like contracts, subcontracts, change orders, warranty certificates, lien releases, Pre-Lien Notices (20 day notices), bids, warranties, and much, much, more right at your fingertips. Change anything that you want. Don't throw your paperwork away when you move! Just change the address! New Laws? No Problem! Need something that is missing? Just Add It! Got a new LOGO, just add it! Don't feel you have to "use up" your old, out of date contracts because you have so much money invested in them. Convert any form to PDF so it can be emailed to your customers. Save time and "running around". Work more efficiently. Never have an out of date contractor form on your shelf again because you can print a few at a time and if you need to make a change you do it before you print the next form. Print your filled in contractor forms on plain paper or print your own carbonless construction forms. Print out blank forms for use in the field. Create anything you have a commercial printer do for you like fliers, business cards, brochures, letterheads, door hangers etc. Even lay out your newspaper, yellow page and other ads! Custom make any construction form you need, you can do it yourself with our software! Use your laptop or Windows tablet or Mac running Windows to fill out and print bids right at the job site instead of typing them out at your office. Be able to see exactly what your form will look like before you print so there are no mistakes. Keep copies of all of your bids and other documents right at hand on your computer where they are easy to find so you don't have to tear your office up looking for a bid you did a year ago that wants the job done now. ...But it was certainly not anyone who has ever had to sit across from a homeowner at their kitchen table and tried to get them to sign one of these contract "BOOKS" that scares the pants off them! You know... a form written by someone who has never tried to explain to a homeowner why your proposal is 10 pages of fine print and your competitors is only one page! The fact is that state and federal law compliant, trade specific forms DO NOT HAVE to be this way! We have something NO other form publisher has or even claims to have... The "boots on the ground" CONSTRUCTION EXPERIENCE earned from writing and managing thousands of construction jobs. Most of the content of these 10, 20 and even 30 page forms covers situations that all but a very, very small number of contractors will likely EVER see... so Why include page after scary page of this un-necessary, fine print "filler" that screams "LAWYER" and makes your customer afraid you are "Laying Down The Law" to them! Our forms have what you need to keep you safe and legal and complaint with the Federal Government and with your specific states laws... and our forms help you SELL THE CUSTOMER... NOT SCARE THEM AWAY! The bottom line... You can have a form covering everything a Lawyer can dream up or that can be copied from samples on the internet, but if your customer won't sign it or you can't explain it to them without a law degree... YOU ARE OUT OF BUSINESS! CLICK to see our PAINTING BID FORM in action! Do Your Forms comply with the latest laws? Call us and our experts will give you a free evaluation! California Contractors, take our FREE form test to see if your forms comply with the latest CSLB laws. The documents you place in front of your customer tells them a lot about your company and in many cases, is the only thing that protects you from costly lawsuits. The right form gives your customer confidence in your business and keeps you out of trouble. The wrong form makes your customer think twice. Why handicap yourself with a form that makes your operation look unprofessional and offers little or no protection? Contracting is a tough, competitive business. Often, the difference between you or someone else getting the job is determined by the impression the customer has. Always leave a good impression by using ACT Contractor Forms. Whether you use our printed forms or whether you use our form software to print your own forms, you will always make the best impression! ACT CONTRACTORS FORMS on DISK SOFTWARE has given contractors just like you over YOUR COMPETITION! Our forms are designed to protect your interests AND to convert more of the bids you go on to paying customers!